The Day They (Almost) Strafed Callaghan's Beach. The (Really) Big Question: Which Monitor? The Flying Lesson: Press "F4"
You Ought To Be In Pictures…. What the Heck is a HOTAS? This site maintained by Kevin Savetz. 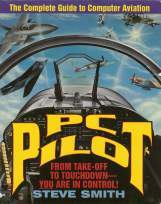 PC Pilot is copyright © 1994, and is posted on www.FlightSimBooks.com with the permission of the copyright holder. Do not redistribute, mirror, or copy this online book.